Today's guest does it all: be it steamy or sweet, contemporary, fantasy or historical, you can have faith in Karen Erickson to give you a romance that will make your heart beat faster and have you exhale with a happy sigh at the end. 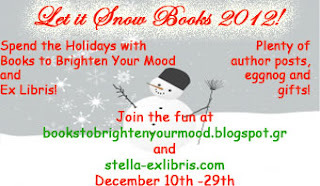 And besides all the above mentioned genres she excels in, Karen is also a fellow Christmas-aholic (like me), having penned several holiday romances (her latest ones are Jane's Gift and Five Golden Rings), so I knew we'd be having lots of fun discussing the holidays! ;-) Welcome Karen! We always have our family over at our house for Christmas. That’s always fun—and crazy. Stella: I bet! Crazy family time for the holidays is my favourite as well ;-) Do you have any favourite holiday themed stories (movies or books)? Karen: Movies, I love Elf and Christmas Vacation. Scrooged with Bill Murray too! There’s a made-for-TV movie starring Susan Lucci that’s called Ebbie and it’s similar to the Charles Dickens’ tale. I have a soft spot for that silly movie too. Karen: I love to see the joy on my children’s faces when they open their gifts. I think that is by far my favorite thing. Seeing their reactions, how excited they are on Christmas Eve, how much fun they have with everything that’s holiday-related. It brings me joy. Karen: Hmm, my Barbie Townhouse I received when I was four rates pretty high. LOL Oh, and the Barbie motorhome I got when I was nine was a favorite too. I loved my Barbies! Stella: I never got a motorhome, but we got a Barbie house with my sis as well, we loved it so much lol :-D What makes you feel that Christmas time is finally here? Karen: Well, advertisers force Christmas on us by showing the ads on TV, etc. earlier and earlier every year. I would say that once we finally get out the decorations and set up the tree, I feel like Christmas time is here. Karen: Christmas music! Though I’m usually sick of it by the time the actual day is here. Stella: Lol, I am a big Christmas music lover, and don't mind listening to it well into February lol ;-) Since this whole event is about the Best Books we read in 2012, could you share with us some of your favourite titles you have read this year? Karen: Oh, sure. I’ve had some Christmases in the past where my husband is gone for almost the entire month of December for work and I’ve had to do everything. That sort of zaps the joy out of the holiday and makes it more of a chore. Sometimes having family over can get, ahem, annoying. But we love them right? Karen: Hmm, well I’m going to pick my own characters and say I’d like to hang out with the Worth brothers (from my Worth It series). Not only would it be rather um…pleasant to spend time with such handsome men but those dudes are filthy rich so I bet they know how to do Christmas right (ha ha)! So yeah, I’d like to be invited to spend Christmas with the Worths and their lovely ladies. I’m sure they’d put on quite the party. Stella: I completely agree, I wouldn't mind if you invited me over *hint hint*, I'm sure we'd have a lovely time! And what would you ask Santa to bring you this year? Stella: Santa, I would be very happy with the same gift Karen is asking for ;-p What would be your (bookish or not) New Year’s resolutions, if you make any? Karen: To try and be more organized. Exercise more. Read more! I didn’t read as much this year. And my TBR is huge at the moment. Check out Karen's holiday stories HERE! 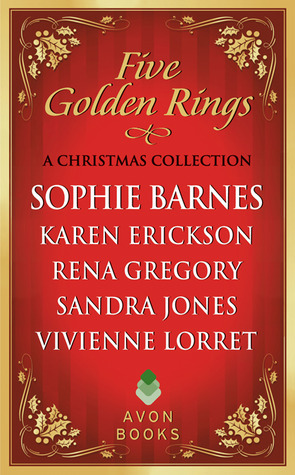 Karen has generously offered any book from her holiday backlist, including Five Golden Rings to a lucky commenter!